In April 2006 I had the opportunity to travel along the A39 between Minehead and Lynmouth. With my camera to hand, I was able to capture the selection of photos presented on these pages. You can find this section of the A39 on a map, here. Time wasn't on our side on the day I drove this road, though as you will see, the weather was very good. A few days later, we visited Porlock and Porlock Weir, but the weather was so grey and murky that I have no photos of this trip, and we decided to forego the pleasure of paying £2.50 to drive up the toll road. Another time, perhaps? 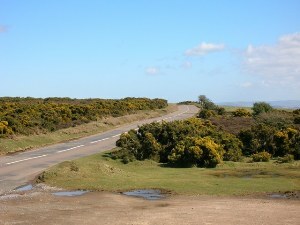 Exmoor was designated as a National Park in 1954. Although one of the smaller National Parks (it is only two-thirds the size of neighbouring Dartmoor), it offers some great driving roads, passing through spectacular scenery. The A39 is one such example. I have to confess that I don't know the Exmoor National Park very well, in spite of having grown up less than 35 miles away. The Bristol Channel proved to be an impenetrable barrier, and the trip by road was nearer 150 miles. So we didn't go there. The small village of Porlock lies nestling amongst the hills of north Exmoor, on the edge of a salt marsh separating the hills from the Bristol Channel. Porlock itself is low-lying, but a steep climb up from the village in any direction will reveal spectacular views of the Bristol Channel and the South Wales coast beyond. There have been human settlements at Porlock for thousands of years. Stone Age remains have been found in the area. The village remains a vibrant local centre with numerous pubs and restaurants where you can sample local fayre. Samuel Taylor Coleridge was apparently interrupted by a man from Porlock whilst writing “Kubla Khan” and as a result he was distracted to the point that he lost his inspiration, and the poem was never completed. This was explained away by Douglas Adams in “Dirk Gently’s Holistic Detective Agency” as a bid by one of the lead characters of the book to prevent Coleridge from discovering how to build a time machine in the late 18th Century. Two miles from Porlock lies Porlock Weir. On a clear day at low tide you can occasionally see the remains of a prehistoric forest, in addition to the more obvious harbour. Unfortunately, on the day we visited, the weather was so awful that we saw very little of this and have no usable photos of Porlock Weir. 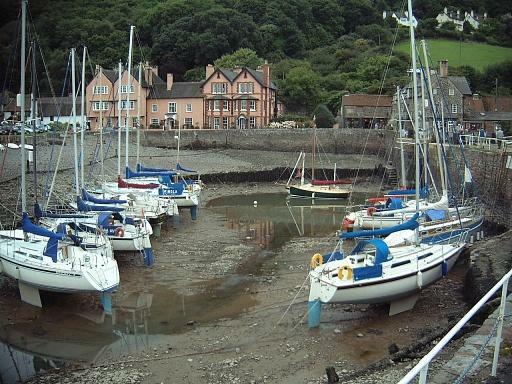 The picture of Porlock Weir Harbour is reproduced by kind permission of Martyn Hicks, who has more photos of the Porlock area on his own website. Porlock Hill is, I believe, the steepest hill on an A road in Britain, climbing about 400m in two miles. It climbs in a westerly direction out of Porlock to a high plateau offering views across Exmoor and the Bristol Channel. There is an alternative toll road, built in 1840 by the Lord of the Manor which caravans and large vehicles are advised to use to avoid Porlock Hill. Even so, the Ship Inn in Porlock kept extra horses especially to help stage coaches climb Porlock Hill.